As we enter into the holiday season, I feel the need to find my joy again. The Lord has laid this on my heart for a while now. My joy, it got lost somewhere in the move I think, when I had to just buckle down and keep going, one foot in front of the other, keep us all moving forward or else we’d fall apart. Just so much change so fast. And somewhere, in all that, I lost my joy. I stopped seeing God’s gifts. I stopped breathing thanks to Him. I stopped stopping in wonder. And now I hear Him calling me back. My head clearer, my heart lighter, I long to find that joy again. 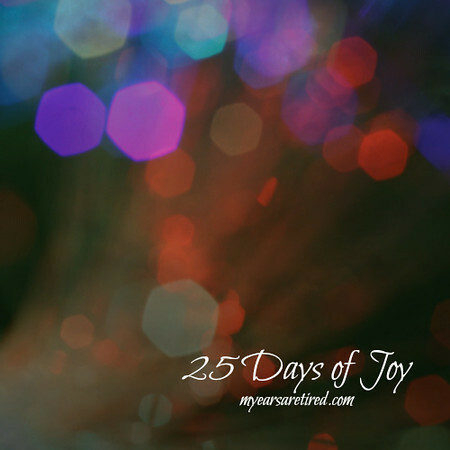 And so that is what I am starting today – 25 days of joy. It would be fun if I could do one a day all the way to Christmas, but I know how I am here and that life gets in the way and I’m not a writer who can sit down on Saturday afternoon and punch out a week of posts. What I write is usually fresh, raw, and in the moment. Plus, it’s already December 2, so that plan went out the window before we ever got off the ground. 😉 I don’t know for sure how long the 25 days will take. But I will be on the hunt everyday for glimmers of joy. Joy Find 1 is this place and all of you…..I don’t write often and I don’t always write “pretty”, but you all have accepted me in my realness and let me into some of yours. I love to encourage women, help them see the beauty God is making in all the brokenness, and in this season of life, this is a place I have been able to do that from the comfort of my home. So, thank you for the joy you have brought to my life by being part of mine. Thank you for your transparency! I have arrived at the end of your first paragraph; recognizing that I have lost joy due to my father’s death this October 3. Right now, I am empty. All I see are endings in my life. Being a believer for 35 years, I know God is waiting patiently… but I am not ready for joy yet. I am not ready to “feel” yet. My prayer is that through your blog, I will recognize joy and in that process, hunger for it again someday.